I once fell prey to the misconception that short-term duty stations weren't worth my effort. My husband and I have moved four times in three years, and have not lived anywhere longer than 8 months. So, I just assumed I would hide out in my home until his training was over and establish myself after he entered the fleet. I, and probably many of you, feel that the workload necessary to get involved with the community for three to six months was not worth the payoff. It takes time to establish friendships. No longer are we toddlers who make friends the second our eyes meet. Instead, we need to find compatibility with our prospective friends, and that is not always the easiest thing to do. Why strive to make connections when you know you won’t be around long? Why build friendships that will last for a seemingly short amount of time? 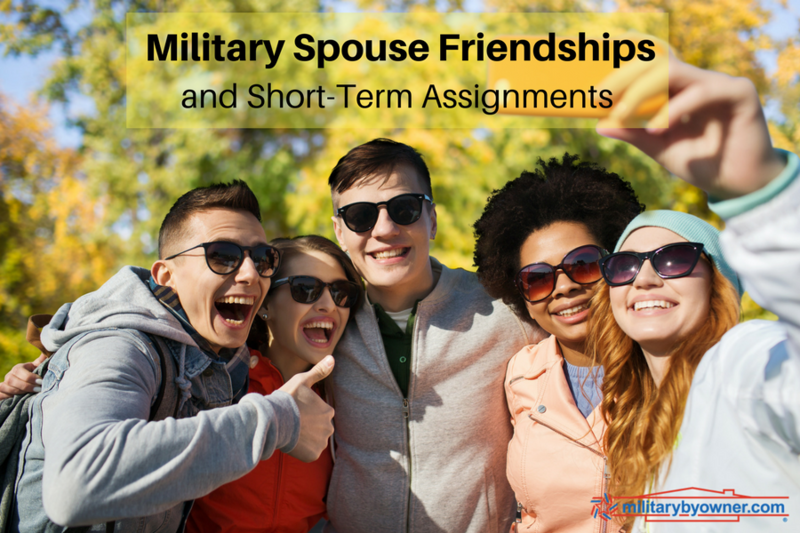 Here are some reasons why I think it's worth making short-term friendships as a military spouse. 1. The military is small. I thought this was a nice sentiment when I heard it two years ago and expected to witness this ten years into my husband’s career. Never did I expect to experience just how small the military is in only three years. Not only have we run into numerous friends since his first duty station, but I can also say that we have lived in the same place twice. We’ve also learned the joy of hearing that old friends will soon be joining us. Reuniting with friends, however short the friendship, is a wonderful feeling as a military spouse. While moving to a new place brings feelings of isolation, reuniting with an old friend makes settling a little bit easier and infinitely more exciting! 2. Opportunity comes in all shapes and sizes. Her words helped me realize that, while I thought I was saving a great deal of wasted effort at our short-term duty station by holding back, I was actually failing myself by doing so. Through isolation, I was failing to meet more seasoned spouses who would be able to tell me their experience as a military spouse. I was not opening myself up to the possibility of making friends with people who may not have been friends with me otherwise. My husband and I are in a unique situation where a great deal of our community consists of friends who are single or friends that are married with children. It is harder to find friends that fit into the exact profile that my husband and I do. And do you know what? It’s wonderful! Because of the military community, we have the opportunity to grow relationships with people that we can learn from. The commonality that the military presents in each of our lives gives us a starting point in a friendship. It makes it easier, no matter the length of time we are stationed somewhere, to make lasting friendships and nurture them while we are apart. Civilian friends keep us grounded. We, of course, are civilians as well but for the sake of wording, ‘civilians’ in this context are friends without a military connection. While they may not fully understand what life is like as a military spouse, they give us the opportunity to feel normal and take part in our local community. I am so grateful for the non-military friends that I have made over the past few years. I remain in touch with each of them and, although they will not be joining me at a new duty station someday, there is always the possibility that our orders will send us back. If we held back at our current station, since we know we will be there for a short time, we would not have the opportunity to make civilian friends. We wouldn’t be able to learn from one another and we wouldn’t be able to enjoy the support system that they provide for us. I think that it's safe to say now that you might agree that it's important to establish new friendships even at a short-term duty station, though you may be wondering where to even begin finding friends in such a short time. Because your time is limited, it's important to put yourself out there first. As soon as you’re settled in, join the local spouses’ Facebook page. You can also look into upcoming events on base to attend, volunteer at your local USO or any other base organization, or find a job in the area. Each of these options allows you to introduce yourself to your fellow community, keep busy, and meet both military spouses and civilians who may become your much needed friends. In Quantico, I volunteered with L.I.N.K.S and Women of the Chapel. In Pensacola, I worked at an early development school. In Corpus Christi, I worked locally and volunteered at the USO on base. Each of these commitments lead me to a great group of friends that I keep in touch with to this day. I encourage you to embrace every step of your military journey and make the most of the opportunities that lie before you. While the jobs, organizations, and homes are temporary, the people and memories are not!